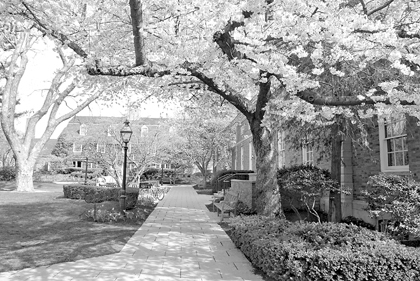 "APRIL'S FIRST-BORN FLOWERS": Shakespeare's Sonnet 21 provides the caption as Princeton comes into its springtime glory on Palmer Square, also the setting for Sunday's birthday tribute to the April-born Bard. Schools Budget Rejected: Now What? Princeton Regional Schools Board of Education held its monthly public meeting last night in the cafeteria of the John Witherspoon Middle School (after Town Topics press time). On most minds was the defeat of the schools budget in last week's election and the question "what happens now?" The Princeton Borough and Township voters who prevailed last week in voting down the proposed $56 million budget for Princeton Regional Schools will likely be disappointed at any new revision as municipal officials indicated this week that there is little to cut. Mildred Trotman is not averse to doing a political dance every now and then to show why, and how, she has been an integral part of Princeton Borough government for more than 20 years. Just don't call her a politician. Since the nor'easter struck Princeton last week, Alex Magoun has had his hands full, and wet besides. Sustainable Princeton, the initiative first introduced by the Princeton Environmental Commission in 2005, acknowledged community members Saturday for their contributions in sustainability, as well as their regard for Princeton's environmental future. John Witherspoon Middle School students have been collecting gallon milk jugs since last September as part of a "Jugs for Jersey Schools" campaign. Wearing a sharp black suit with an orange tie, Sydney Johnson looked the part in being introduced as the new head coach of the Princeton University men's basketball team last Monday." The chances of any post-season play were on the verge of slipping away for the Princeton University softball team last Saturday as it hosted surging Penn for the first of two doubleheaders over the weekend between the rivals." For about 10 minutes in its game against WW/P-N last week, the Princeton High School girls' lacrosse team gave a glimpse of how potent it can be."